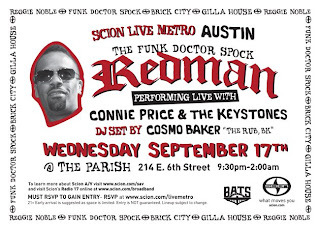 From the F*ckieMae & FreddyF*c department... Redman @ The Parish on Sept 17th with Connie Price & the Keystones! Another free show by Scion, RSVP here. So it's being reported that Lance Armstrong is coming out of retirement to ride in next year's Tour de France. I guess the lone nut was missing the chafing from the bike seat! Reginald "Reggie" Noble (born April 17, 1970), better known by his stage name Redman, is an American rapper and actor. He came to fame in the early 1990s as an artist on the Def Jam label. He is also well known for his collaborations with Method Man, including their starring roles in films and sitcoms. He is of African American and Korean origin. Redman was born in Newark, New Jersey. Newark is also known as Brick City New Jersey, where he lived in Waterside Gardens and attended Brick High. In 1992 Redman released his debut album, Whut? Thee Album, which Allmusic noted for blending "reggae and funk influences" with a "terse, though fluid rap style". The album peaked at number forty-nine on the Billboard 200 and was certified gold. He was named "Rap Artist of the Year" by The Source. Redman followed up with his 1994 album, Dare Iz a Darkside. The first single, "Rockafella," samples Leon Haywood's "I Want'a Do Something Freaky to You" and George Clinton's "Flashlight," two of the most sampled songs in hip hop. In December 1996, Redman released Muddy Waters. Rolling Stone wrote that he provides "choppy, offbeat verses and memorable call-and-response choruses" with a "stripped down but tight" production from producer Erick Sermon. Allmusic noted that lyrically, Redman is "as strong as ever" with his "clever metaphors and loose, elastic rhyme flows". The album solidified his reputation as one of the most consistent rappers of the 1990s.